ACQ5 Presents - How DSS is "Making Lives Better"
The desire by E. Jay Saunders, the Founder of DSS, to help make others’ lives better started back in the 80’s and 90’s while growing up in the Turks & Caicos Islands. Living in a country that is situated a mere 140 miles from Haiti (the poorest country in the Americas and one of the poorest in the world, with approximately 59% of its population living under the national poverty line), allowed E. Jay to witness the harsh realities of poverty and a lack of financial inclusion first hand. “The lady who took care of me as a baby came from a town in Haiti named Gonaïves. She worked for my parents for almost 40 years. In addition, many of my friends were Haitians, and so I grew up witnessing the challenges that they faced up close,” says E. Jay. The lack of financial inclusion in Haiti is so severe, that in 2014 over 80% of its population was unbanked. It is also bad in Haiti’s closest neighbor, the Dominican Republic, whose citizens make up the second largest immigrant group in the Turks & Caicos Islands (behind the Haitians). Approximately 50% of Dominicans were found to be unbanked in 2014. When one takes into consideration the large Filipino population residing in the Turks & Caicos Islands, and whose 2014 unbanked population stood at approximately 70%, the Turks & Caicos Islands has more than 50% of its resident population being affected directly (they themselves maybe unbanked) or indirectly (their loved ones back in their home countries maybe unbanked) by a lack of financial inclusion. For E. Jay, the Turks & Caicos Islands presented a great location for him to formulate and refined his ideas on the best ways to bank the unbanked in the Caribbean and Latin America. Prior to launching Digicel TCI, E. Jay was Head of KPMG Consulting in the Turks & Caicos Islands for almost 7 years, and that experience, along with his academic background (he majored in Computer Science), gave him the confidence that he could develop a solution to address the lack of financial inclusion in the Caribbean and Latin America. During the Christmas holidays of 2013, E. Jay worked on the basic designs and rough code, including the artificial intelligence concepts that became the blueprint for what was dubbed “The Panther Project”. In October 2014, he purchased the full rights to The Panther Project from Digicel TCI and stepped down as its CEO (remaining a Director and a shareholder). DSS seeking to improve financial inclusion around the world is not just a noble goal, but also a necessary one, as according to The World Bank, at the end of 2017, there were “[a]round 2 billion people [that didn’t] use formal financial services and [that] more than 50% of adults in the poorest households are unbanked.” Despite the best efforts of organizations like The World Bank, the United Nations, and the Bill & Melinda Gates Foundation, over a quarter of the world’s population is still unbanked. Add the under-banked population to that number, and approximately 40% of the world’s population do not have sufficient access to mainstream financial services and are often deprived of banking services. Increasing financial inclusion around the world is critical, as it is a key enabler to reducing poverty and boosting prosperity. Bringing persons into the formal financial system helps them make day-to-day transactions, including sending and receiving money; safeguard savings, which can help households manage cash flow spikes and build working capital; finance small businesses, helping owners invest in assets and grow their businesses; plan and pay for recurring expenses; mitigate shocks and manage expenses related to unexpected events; and improve their overall welfare. And the benefits of financial inclusion are not only significant for individuals but for economies as well, as it plays a role in reducing extreme poverty. SafetyNet.ai, which DSS describes as “an Enhanced Due Diligence (EDD) cognitive search and crime prevention tool”, was initially developed as DSS’ in-house tool to ensure that its Wowlet platform met the FATF’s recommendations. It contains one of the largest databases of global sanctions lists, with millions of names of high-risk entities, politically exposed persons (PEPs), and persons in public life (PIPs). At its core, SafetyNet.ai has an artificial intelligence (AI) engine built on top of IBM Watson along with best-in-class AI tools from Amazon, Google, and Microsoft. Utilizing the latest advances in AI from these technology powerhouses along with its own proprietary code, SafetyNet.ai performs EDD checks on subjects-of-interests the way human experts do, but at a quality, depth, and speed that exceeds what a human expert can ever achieve on their own. Its searches an organization’s internal files as well as the surface, deep, and dark web, analyzing structured and unstructured information (including global court cases, criminal registries, government records, curated news sources, and others) in multiple languages at speeds that exceed a hundred million pages per second. SafetyNet.ai continuously monitors thousands of information sources from across the globe with its datasets growing by tens of thousands of documents per day. The list of companies that must comply with the FATF’s KYC recommendations includes Banks, Securities firms, Insurance companies, Foreign Exchange dealers, Money Remitters, Casinos, Lawyers, Accountants, Real Estate agents, Dealers in Precious Metals and Stones, and Trust and Company Service Providers; and over 180 countries have committed to implementing and upholding the recommendations. To cater to these customers, DSS has made SafetyNet.ai commercially available as a cloud-based Software-As-A-Service utility (SaaS). It is E. Jay’s hope that international banks would use SafetyNet.ai, the 2017 winner of the A-Team RegTech “Most Innovative Compliance as a Service Solution” award, to not only meet their internal KYC/AML obligations, but also as an alternative option to “de-risking”, especially in the Caribbean and Latin America region, where it has become a serious threat to the region’s economic and political stability. De-risking is the term used to describe the measures being carried out by international banks to reduce their risk exposure in response to tighter regulatory standards especially around money laundering and terrorist financing. Some of the measures include termination of correspondent banking relationships (CBRs) with local banks, “strategic” market repositioning, complete withdrawal from selected markets, and the closing of accounts of selected clients and classes of clients. “Utilizing SafetyNet, local banks can, if necessary, monitor their entire client list on a continuous 24x7x365 basis, thereby allowing them to be immediately alerted to high-risk clients so they can quickly take the necessary actions to eliminate or mitigate the risk. 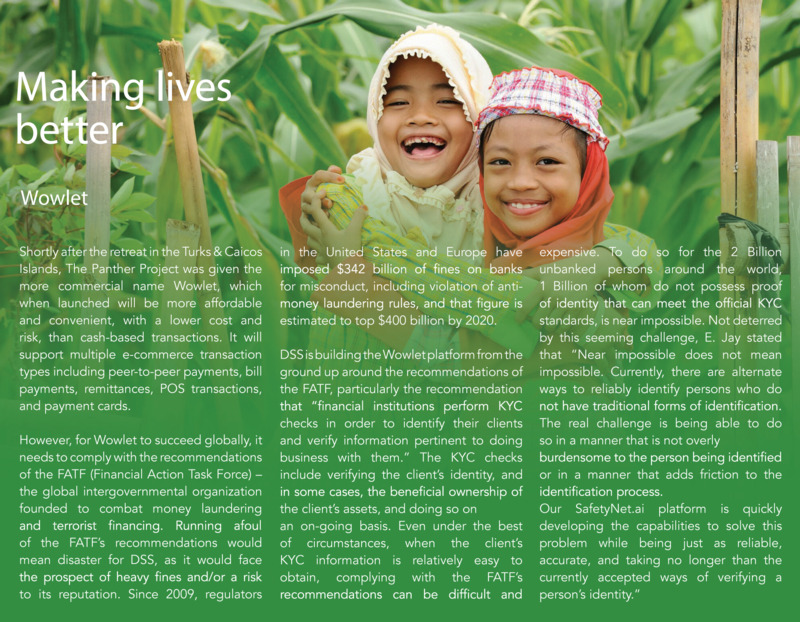 While SafetyNet doesn’t address all of the drivers of de-risking, it does allow local banks to take a proactive approach to KYC and AML, which should give the international banks a measure of comfort that they can move away from applying blanket de-risking measures across the whole region to one where the risk level and associated measures are driven down to the client level,” states E. Jay. If de-risking continues, it could put at risk the US$75 billion of remittances coming into the region every year from the Caribbean and Latin American diaspora. These remittances are a lifeblood for the recipients, as they are primarily used to purchase basic goods like food and to cover expenses such as education and health-care. In 2017, DSS made three pivotal decisions that resulted in SafetyNet.ai being used not only for “making lives better”, but also for saving lives. Seeking to expand the breadth of SafetyNet.ai’s search capabilities, DSS added the ability to search an organization’s internal network as well as the ability to search the Dark Web. This meant that SafetyNet.ai could now simultaneously conduct “Vertical” searches – i.e. up to the internet including the Dark Web – and “Horizontal” searches – i.e. across an entire organization, even branch offices located across multiple geographic locations. And to quickly and easily extract information from all of the data that SafetyNet.ai acquires, DSS built a cognitive link analysis tool called “Visualize Connections” that can graph structured and unstructured information. Included in all the data that SafetyNet.ai consumes on a daily basis are a large number of facial images. Taking advantage of the advancements made in machine vision by the AI community in 2017, DSS added facial recognition capabilities (for both photo and video) to SafetyNet.ai. Named “Facial Search”, this new feature has the ability to simultaneously connect to multiple video surveillance devices and analyze their video feeds in real-time. Due to the combined power of these new features, DSS has made them available in an enhanced (law enforcement only) version of SafetyNet.ai called “SafetyNet Safe City”. With SafetyNet Safe City, law enforcement organizations can take a proactive approach to the detection, investigation, and solving of crimes, particularly serious crimes; and governments can provide safe neighborhoods for their citizens, secure their borders, and protect their strategic assets, without having to scale up their manpower. Commenting on the rollout of SafetyNet Safe City, E. Jay stated that “We take our role as a technology partner to the law enforcement community very seriously. Due to SafetyNet Safe City’s advanced features, aggressive price, low total cost of ownership, and high return on investment, many countries that grappled with serious crimes in 2017 are looking at deploying it. 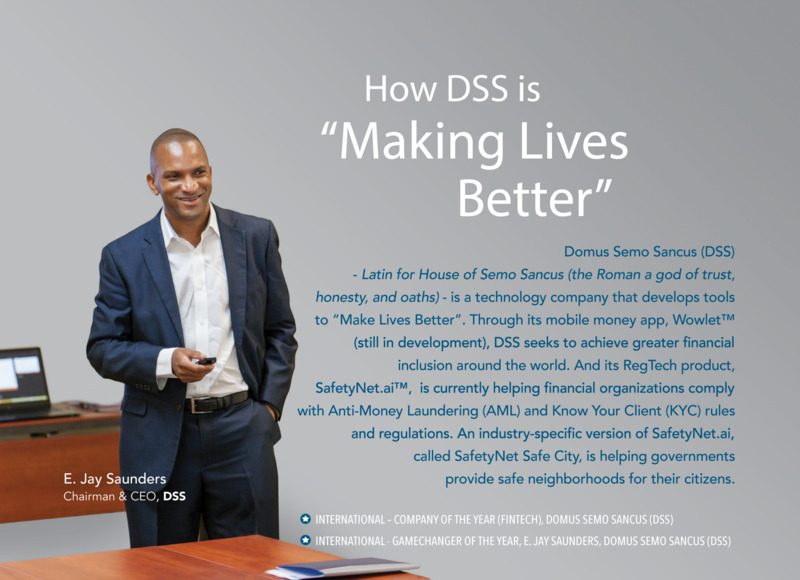 We are currently running pilot projects in a few markets, and based on the preliminary results, it is clear that SafetyNet Safe City can and will play a pivotal role in the saving of lives in the near future.” The way DSS sees it, the ultimate way to make someone’s life better is by saving it.